Your roof endures all kinds of beatings every year that you’ve probably never given much thought about. It’s a crucial part of your home, protecting you and your family from extreme weather year after year. From the blazing sun to the icy winters, your roof is your home’s first line of defense. Certain damages or details can go undetected and lead to bigger problems down the road, therefore, it’s a great idea to inspect your roof regularly. Here are a few common roof problems and how to fix them. If you’ve hired a roofer in the past, they may have hurt your roof without you even realizing it. Inexperienced or sloppy roofers sometimes put roof cement near the flashing areas to get the job done faster. It seals out water for a short period of time, however, it quickly hardens and will crack, resulting in leaks. This leaves you with a headache and a thinner wallet having to fix the problems. Experienced roofers will properly flash the roof. It takes a lot of time and expertise, which is why lazy roofers simply skip this step altogether. Metal flashing prevents leaks and is found where shingles collide with other areas such as walls and chimneys. If you ever see heavy tar on your roof, make sure you get it fixed correctly by a roofing professional to avoid leaks and further roof damage. Roofing contractors typically offer free hail damage inspections if you suspect you’ve had any damage. Just one large hailstone can tear or puncture a shingle. Luckily for homeowners, it usually just knocks the asphalt granules off the surface of the shingle. However, this can still cause damage over time. When the shingle loses these granules the UV rays begin to destroy it. Hail damage can take time to show, so it’s smart to get it inspected by a trusted roofer. Any chimney that’s wider than 30 inches, or even some that are smaller, depending on the house, needs a cricket. Crickets form a dam on your roof, essentially it’s a small roof behind your chimney to protect it from moisture and debris. When a cricket is properly installed it will effectively move water and debris around your chimney and off of your roof. Without a cricket, water and debris can cause rust, holes, and roof damage. 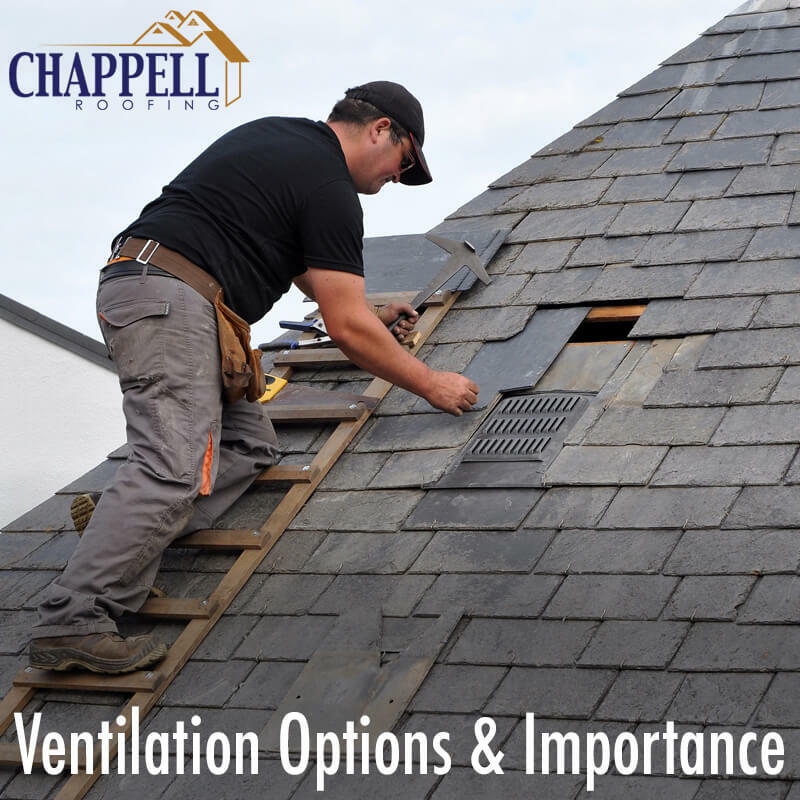 Chappell Roofing is ready to help you with all of your home or business roofing needs. We only use the highest quality materials and work hard to ensure your roof is the best functioning (and looking) one on the block. For a free inspection or estimate please contact us today! We’re ready to help.